Adobe-style custom home with magnificent panoramic view of Sangre de Cristo Mountains. Slow down. Take in the scenery. Enjoy the crimson hues of the mountain range at every sunrise and sunset from our unique second-story gazebo and spacious portals, or just stay cozy inside and gaze at nature from our walls of windows. After a hard day on the ski slope or from hiking, relax in the bubbly hot tub, read your favorite book by the fireplace, or sip your favorite drink on east-facing portals equipped with exterior speakers. This well-appointed, comfortable home tastefully displays a collection of southwest potteries, paintings, lightings, custom stained glass artwork and other collectibles in every room. It offers 3 bedrooms. The first master bedroom is complete with a wood-burning fireplace and an en suite bath with a whirlpool tub and double sinks. The 2nd master bedroom also sports an en suite full bath with double sinks and a spacious shower. The 3rd bedroom comes with a full bath next door. The spacious 21' x 25' great room truly speaks to quality family time as it provides multiple seating areas, a surround sound entertainment system and a collection of table games for the young and old. The house has an ideal chef's kitchen: it is equipped with all new LG kitchen appliances in trendy black stainless steel. The kitchen also provides all sorts of cookware, cooking utensils and serving dishes for any size meal-sharing. The laundry room is outfitted with state of the art washer and dryer, and all the bedrooms and bathrooms come with luxurious linens and towels. Eastern Star Retreat is a single level, modern, custom-built adobe-style home. No sunken living room or baths (which are common in this area). No steps or stairs to climb or maneuver. Certainly, convenient and safe features for all members of the family. The radiant floor heating system under the Saltillo tiles provides gentle, even, warm air throughout home in the winter months. In the warmer months, the evaporative cooling system naturally changes the warm, dry air of this region to cool, moist air inside the home. You will feel instantly welcome and pleased as you enter the house and are presented with a foyer, a fireplace and a majestic mountain view. A true family get-away vacation! In the event you find the need to stay connected with the information highway, the high speed, fiber optic internet is in place for you. Eastern Star Retreat is located 5.5 miles to Taos Plaza and 15 miles to Taos Ski Valley. Only a short drive to shopping, restaurants, museums, and all outdoor recreational activities including fly fishing, biking, hiking, horseback riding, skiing, snow boarding, white water rafting, and golfing. Eastern Star is the perfect retreat for ALL seasons. Eastern Star Retreat special offer: book for 7 nights and get one night free! Ask us about this special offer and we will make the price adjustment for you at time of booking. Kent and I are from Texas and we love to go to Taos and be away from the hot and humid weather for a few days. We have also been in awe with the New Mexico landscape. After a few trips to Taos, we decided to buy a home here. As the Taos locals have told us, "The mountain is calling!" and, yes, we responded heartily by claiming it as our second home. If you like nature, you will love it at Eastern Star Retreat! The house is located just outside of town where you can truly appreciate the wide open spaces of Taos. 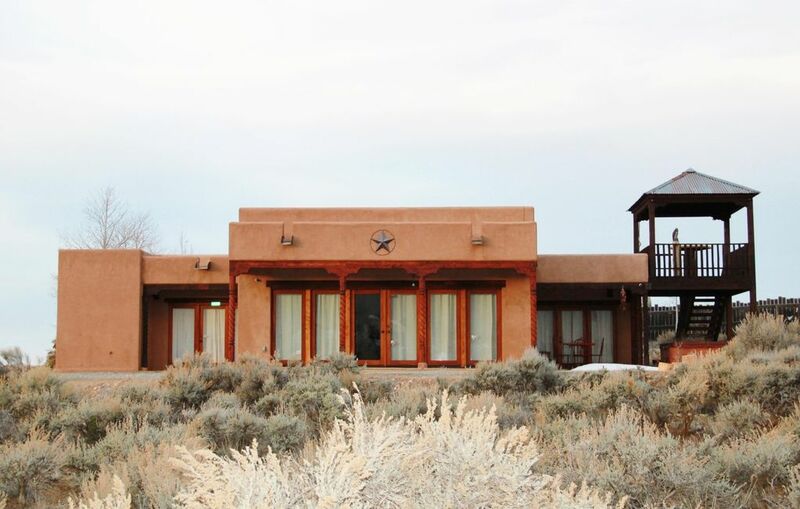 At Eastern Star Retreat, you'll enjoy the 360 unhindered view of the Taos mountains. The Taos county, itself, stretches over 50 square miles. The average number of sunny days is 300/365. It has a mixture of diverse cultures that include that of Native Americans, Spanish and Anglo. Taos offers all kinds of outdoor activities all year round. The options are endless: e.g., skiing, snow boarding, snow shoeing, rafting, kayaking, hiking, golfing, horseback riding, biking, and hot air ballooning. Even if you are not as much of an outdoor sport enthusiast as you would like to be (i.e., like some of us), you'd still enjoy sitting back on the porch and soaking in the beautiful weather, pristine setting, and majestic mountain views. Personally, I feel blessed whenever I am there. Guests frequently tell us they love our 2nd story gazebo! It provides a truly unique view of the Taos' mountains and valleys. They also love our large hot tub ...such a wonderful way to get a massage, pain relief, or simply relaxing entertainment . All 3 bathrooms are full size. Both master bedrooms have en-suite baths with double sinks. The third full bath in hall, next to 3rd bedroom. In this region, evaporative coolers are preferred over the traditional air conditioners to take advantage of the dry climate. Eastern Star Retreat utilizes evaporative cooler. Our radiant floor system heats rooms gradually from ground up instead the traditional forced air system which sporadically blasts heat from ceiling/wall vents, & roasts our upper body intermittently. Comfortably sits 6 at dining room table. Seven additional seatings at kitchen counter, on bar stools. Variety of tables games, card games, jigsaw puzzles for good old in-person entertainment in real time! Eastern Star Retreat is single story and has no steps up or down throughout home. No split-level and no sunken-living room make it convenient and safe for the young and old. This feature is uncommon in homes in this area. One of the en suite baths has a walk-in shower, the other has a large jetted Whirlpool tub. The 3rd separate bath has a full size tub. Perfect for everyone's needs. Great response to any issue, we asked to have the hot tub topped off and it was done by the time we returned from our ski day! Wonderful home. Well equipped, comfortable and nicely situated for activities around Taos. Great views from great room and the spa. Slight car noise due to proximity of the roadway. I would definitely come back and stay here again. Incredibles views & a beautiful house. Our family of four stayed over Christmas and the house was fabulous. It is just a few miles out of town which allows for the expansive mountain views. The house was clean and well furnished with everything we needed. The kitchen was well equipped and had updated appliances. The rooms were comfortable and nicely decorated. Everything was as pictured. The owner is always accessible and they have left detailed instructions for everything. I would recommend staying here and hopefully we will stay again. It's heartwarming to know that Eastern Star Retreat was enjoyed by you and yours. The views of snow capped mountain range, which often last well into May, usually immediately grab guests' attention when they've arrived at the property. The home is located only 5 miles from the Taos center, a short drive to shops and grocery stores, and yet feels very retreat-like because of the acreage that our property has, along of our neighbors. Equally important, guests have told us that they enjoyed the wonderful attention to details in terms of home decors, sensible and helpful instructions, and cleanliness. We are happy and proud that Eastern Star was a part of your family vacation experience. We look forward to your return. Great space for a family get-together. We enjoyed the chef's kitchen and great room. We'll be back! Exceptional rental of lovely Taos area home. Our stay at Eastern Star Retreat was wonderful. The home is beautifully designed & decorated and nicely appointed with upscale amenities. Had everything that was needed to make the stay exceptional. The owners were very accommodating & even checked in to make sure everything was perfect; which is was. The home is located in a perfect setting for a relaxing Taos vacation. Details are exactly as pictured. We highly recommend this beautiful property to anyone interested. Awesome home and great location! Very spacious and beautiful home. Perfect location for getting to adventure in the mountains and some of the best places to eat and drink! Awesome views as well. Hot Air Balloons in Taos offer a unique experience where you can enjoy the view of the vast and mountainous landscape, and the rugged earth and winding water ways of the Rio Grande below. When inflating, it is noisy. But, once aloft, you'll be at awe with nature as you glide in the air. You'll feel the serenity, calmness that is uncommon in our busy daily lives and so refreshing! At the same time, a hot air balloon ride can be an exhilarating experience as you float high in the air and then dip down into the Rio Grande Gorge. Flights usually take off in the early morning, at sunrise. Dress warm. Taos ballooning companies offer balloon safety and flight lesson, including firing off the burners and flying the balloon. If you wish, you can take the lesson. But, most just enjoy letting the pilot have the control and are there just for the ride. Book for a 7 nights stay, get 1 night free! Rates are subject to change until reservation is confirmed.